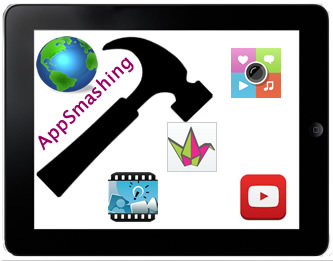 AppSmashing is a popular method of combining two or more apps to create, publish and share content. AppSmashing challenges us to discover new possibilities for teaching and learning with an iPad and presents us with greater possibilities for helping the device meet our goals. Recently, the work that I do with ThingLink EDU has connected me with Ed Charlwood, the Head of Design and Director of Digital Learning at an Independent school in West London. Ed’s ideas was to host a ThingLink Creative Challenge for students, known as the Product Deconstruction Challenge. This is an amazing project that challenges students across the globe to learn about everyday products we use by taking them apart. The first round of this project runs through December 4, 2015 and all students are encouraged to enter. At the time of this writing, we now have 34 student entries in the Product Deconstruction Challenge. This provides me with a great opportunity to do some AppSmashing to quickly share and publish this amazing collection of student work. The example below takes advantage of just two Apps, ThingLink EDU and Padlet. It demonstrates one of the easiest ways to quickly share and publish the work that was created for the Product Deconstruction Challenge. Taking this a step further, this collection can be embedded and shared in a variety of teacher claimed websites, blogs or wikis. After students select a product and disassemble it, they are asked to arrange the pieces in an attractive display and take a photo it. The photos are then uploaded to ThingLink and students add tags with text, video and images to identify each part of the product and what material the product is made of. They must include a justification for use of the material. Interactive images are submitted using the ThingLink Creative Challenges tool and the results are immediately displayed for anyone to explore. In this case, I used the Padlet extension for Chrome, a handy button that allows users to quickly grab content and publish it to an existing Padlet without having to switch screens. Just click on the ThingLink image to view it, click the Padlet button in the toolbar and the content is immediately added to any existing Padlet without having to switch the screens. The process of adding the ThingLink images to Padlet took less than 10 minutes. Alternately, students can actually add their own images to a Padlet, without logging in, simply by copying the link to the ThingLink, tapping on the Padlet itself, and pasting the link in the appropriate place on the Padlet. The beauty of this AppSmashing example is that the ThingLink images are live and interactive right on the Padlet. Try it yourself by selecting one of the images and exploring the tags! In classrooms, we often dedicate a good chunk of class time to sharing student work that requires students to stand in front of the class and explain the learning. While this experience is beneficial to the student who is “on the stage”, students sitting and listening are passive participants who may or may not be paying attention. Perhaps a more efficient and effective way to share student presentations can be utilized with the help of student created screencasts and adding Explain Everything to the AppSmashing process can truly maximize instructional time and engagement. Did you know there is a built in web browser in Explain Everything that allows users to pull up content from the web and record and explain it via a narrated recording? The built in web browser provides a great tool for AppSmashing as an alternative to traditional, stand-alone classroom presentations. Here is how it could work in combination with ThingLink and Padlet. Open the ThingLink in the web browser in Explain Everything. Narrate and record a guided tour of the ThingLink. Upload the completed Explain Everything to YouTube. Copy and paste the link from YouTube to a Padlet. I added an older example demonstrating AppSmashing with ThingLink, Explain Everything and YouTube to the Padlet you see below. The narration was designed to teach others how to find the web browser in Explain Everything so it could be helpful to those interested in trying this AppSmashing idea. Since Padlet doesn’t require a login, I invite innovative educators from across the globe to add their own AppSmash examples here. I happen to be teaching 6 AppSmashing workshops tomorrow, and hope to have more teacher created examples for display. I hope to see this Padlet grow with examples from those workshops, as well as examples from innovative educators reading this post. If you an innovative educator with a great idea for leveraging the power of technology for teaching and learning, I invite you to collaborate and share your ideas on this blog during the month of October. In addition to adding your AppSmashing ideas to the Padlet, perhaps you will consider writing a quick guest post or sharing work through a webinar. To get started, let’s connect.